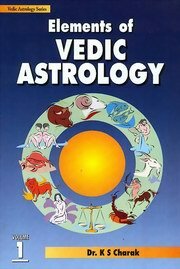 The 'Elements of Vedic Astrology' is an excellent and most comprehensive book on the Parashari system of Vedic astrology written in English. It treats astrology in a most organised and scientific manner. The book deals elaborately with mathematical aspects of astrology. Two important dasha systems, the Vimshottari and the Yogini have been described. It enters into areas of research, like the vargas, the sub-planets, and the planetary states or avasthas. Three chapters are devoted to the all-important subject of the yogas which form the basis of many an astrological prediction. The Nabhasa yogas have been dealt with, and classfied, in a most innovative manner. Results of planets in various houses, signs, etc., have been described in great details. Several other subjects like planetary strengths, Balarishta, Arishta Bhanga, determination of longevity, medical astrology, horary astrology, annual horoscopy, planetary transits, Ashtakavarga, Muhurta and methods of matching charts for marriage purposes, etc., have all been dealt with lucidly. The book is profusely illustrated by example horoscopes. A must for all beginners of Vedic astrology. Charak was once associated with K.N. Rao, these books were produced during their association. The third edition adds a chapter on chart matching to an already excellent work. Charak's two-volume set is not only a teaching manual, it is also useful as an on-going reference. It is essentially the Parasara method boiled down into two books. Highly recommended. Dr. K S Charak, MS (Surgery), FRCS (UK) is Head of the Surgery Department at the Indira Gandhi ESI Hospital, Jhilmil, Delhi, India. He is the Honorary Editor of the bi-monthly Vedic Astrology. Author of several books on Vedic astrology, his extensive work in the field of astrology has earned him international recognition.